If any room is the heart of your Anchorage home, that room is the kitchen. If any portion of your kitchen is the centerpiece of the living space, that portion is your countertops. The moment that you enter the room, the first thing that you notice is the countertops. At the same time, you countertops are the primary work space of the area. It's no wonder why countertops are one of the first aspects of this room homeowners want to change during kitchen remodeling in Anchorage. If you want to make a truly remarkable change to your kitchen, you should consider installing new countertops in the living space. At Vogel Home Improvement, your Anchorage kitchen remodeling contractor, Bob Vogel, would be honored to assist you with the effort. He has the knowledge, skill, and experience necessary to help you select and install the most beautiful and highly functional kitchen countertops possible. 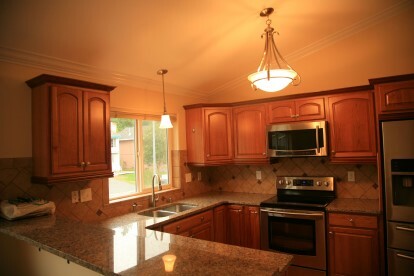 Call Vogel Home Improvement today if you are planning a kitchen remodeling project in Anchorage. The following information is also available in order to help you get this project started. 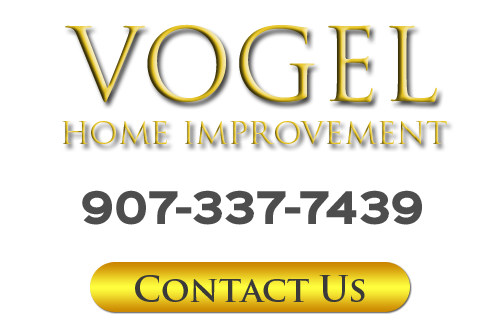 Call Vogel Home Improvement if you have any countertop related questions or to schedule your appointment today. If you are trying to make a stunning change to the look and feel of your kitchen, you should consider installing natural stone countertops. Two of the most popular materials in this category are marble and granite. Marble countertops have a classic Old World appearance that looks fantastic in both classically and modernly designed kitchen spaces. The gravitas and unique grain of granite looks amazing in contemporary and rustic kitchens alike. Both materials are hard-wearing, long lasting, and low maintenance. If you are trying to make a truly unique change to you kitchen, you should consider installing a tile countertop in the area. Because tiles come in countless colors, shapes, styles, and finishes, the design possibilities are endless. Your Anchorage kitchen remodeling contractor can help you develop a pattern that is one-of-a-kind. You and your family will love the results. Perhaps the most often overlooked countertop material is wood. Because countertops are constantly exposed to moisture, people often think that they cannot install a wood countertop. However, there are countless wood countertop materials that are specifically manufactured to withstand heavy kitchen use. The natural warmth and beauty of wood kitchen countertops are absolutely amazing. With the help of your remodeling contractor in Anchorage, you will be able to choose and install the perfect option for you, your family, and your property. If you are interested updating your kitchen countertops or investing in kitchen remodeling in Anchorage, call Vogel Home Improvement at 907-337-7439 or complete my online request form.